The Quest brand brings you this Rotisserie Grill with 7 x Skewer. Compact, ideal for home or a caravan. Quick, slow roasted flavour. Clean Cooking, removable drip tray. This Powerful 1500W Rotisserie grill is for versatile healthier cooking. Clear viewing panel. Accessories included. 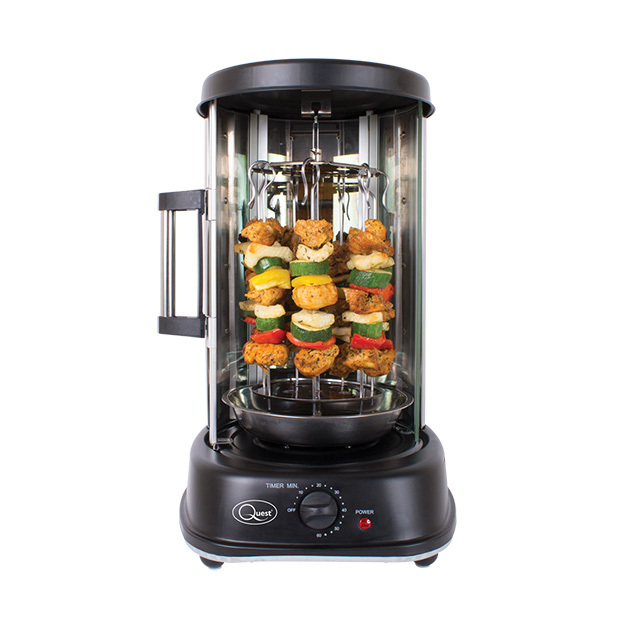 This vertical rotisserie grill is perfect for cooking a large chicken (& other meats) or up to 7 kebabs at once. The 360°C rotation features helps cook your food quicker and more evenly than in a conventional oven & fat drains away into the drip tray. The rotisserie is also fitted with an adjustable 60 minute timer, so you can set it running and not worry about it keeping going if you forget its running. Compact, ideal for home or a caravan. Quick, slow roasted flavour. Clean Cooking, removable drip tray.